According to the National Association of Realtors (NAR), homes sales remain sluggish across the U.S. The good news is that Lawrence Yun (the NAR’s chief economist) expects stronger sales activity in the second half of 2011. Whether you’re thinking about selling your home or staying put until the market rebounds, adding curb appeal is always a wise investment. While real estate agents and home buyers are thinking: “location, location, location,” start thinking about how to grab their attention the first time they drive through your neighborhood with curb appeal. Make a great first impression on potential home buyers. Improving the front exterior of your home is the best way to stand out – especially in a buyer’s market. Since the first thing a home buyer sees is your front door and yard, a PCA custom aluminum screen door or enclosure will add instant curb appeal and elegance. Are there foreclosures or short-sale properties in your neighborhood? If so, curb appeal is critical to making your home stand out. Installing a quality decorative screen door is a cost-effective alternative to major exterior renovations and has immediate benefits. If you’re not selling right away, you’ll enjoy the beauty and comfort of a cooler, bug-free home and a screen door that’s amazingly durable. Don’t blow your home inprovement budget on one upgrade. Some exterior upgrades are surprisingly complicated and expensive. A new front porch might seem like a great idea to take your home to the next level, but construction will be costly and time-consuming. If you’re selling, you won’t be around to enjoy such a large project. A PCA screen door or enclosure can be installed in a day and will save you thousands of dollars. Because every PCA door is handcrafted with the highest quality materials, you’ll be adding more than just curb appeal. When a prospective buyer first visits your home, they’ll notice the elegance and beauty of your PCA door. Up close, the durability alerts home buyers and real estate agents that your home’s entire construction has been prioritized and well maintained. PCA’s aluminum screen doors can be customized to match any architectural style, color and size. Because our doors are installer-friendly, they can be perfectly installed in historic or older homes with slightly uneven entrances or door frames. You know the neighborhood and the types of home buyers it will attract. Families with young children, couples with pets, retired couples? 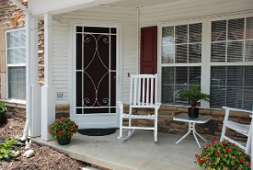 Any home buyer will benefit from a PCA screen door. Who wouldn’t appreciate more fresh air and lower energy costs (less use of your AC! ), a more secure screen and door latch, no bugs, an optional pet door…the list goes on! Whether you’re selling or staying, contact PCA Products to learn more about our custom aluminum screen doors and enclosures. Or start building your enclosure online to see how easy it is to transform your home into the most sought-after property in the neighborhood.